Journal of Values Education is an interdisciplinary peer-reviewed academic journal that was first published in 2003. The journal is the first academic periodical in Turkey, publishing in the field of values education. Besides covering subjects on religion, ethics, values and character education, original research subjects, experimental and descriptive studies in other related fields of social sciences are also being published. 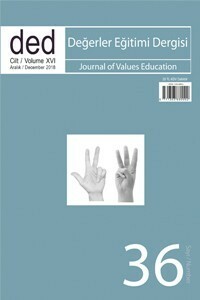 The Journal of Values Education publishes research in both English and Turkish languages. Studies submitted for publication are subject to double-blind reviewing by at least two referees. All studies are checked for plagiarism. No charge is requested for publications. Once the reviewing process of the article is completed, authors are required to submit a 200-word abstract with a 1500-word summary. The journal is published twice a year (25 June and 25 December). Degerler Egitimi Dergisi is licensed under a Creative Commons Attribution-NonCommercial-NoDerivatives 4.0 International License.